Tinfoil Tiaras - Ottawa fashion blog: swap til you drop! For all you Ottawans who are looking to spruce your wardrobe up on the cheap and cheerful, do I have an event to share with you! This Sunday (August 18) from noon-3pm, Starfish Events is organizing a clothing swap at The Space (200-139 Bank Street) and extra clothing will be donated to the Youth Services Bureau. I've previously hosted a clothing swap of my own and it's so much fun to get together with friends and recycle clothing for a good cause. If the video below doesn't work for you, you can watch me on Facebook sharing a sneak peek of some of the items I will be donating along with styling tips. 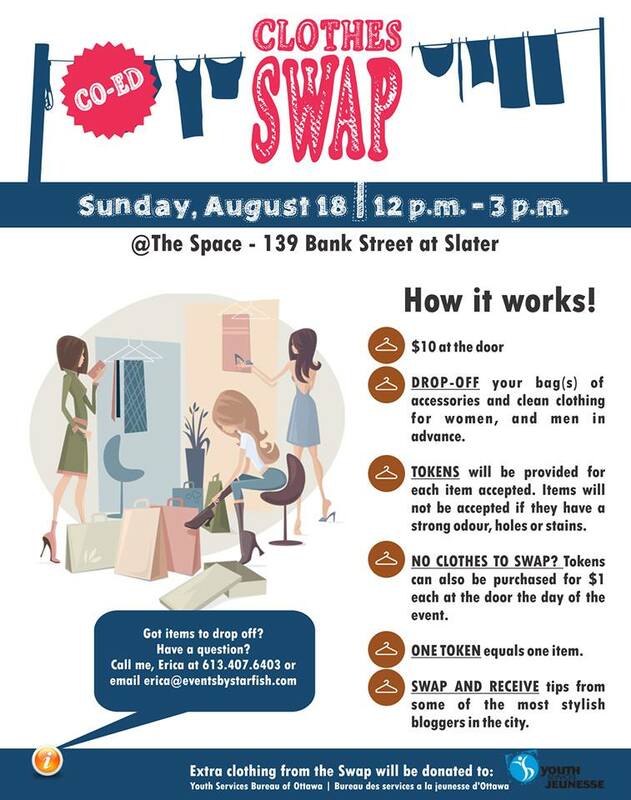 I hope to see you on Sunday, why shop when you can swap! You are so cute!! I held on to a bag of clothes for months in hopes of getting an opportunity to go to a clothes swap, but eventually I needed the storage space and gave it away a little before this event. Hope you scored some good finds! I LOVE the fringed scalloped top but I don't think I could pull off the colour either.